For the past couple weeks, I have been training in Germany with the USBA national A team. 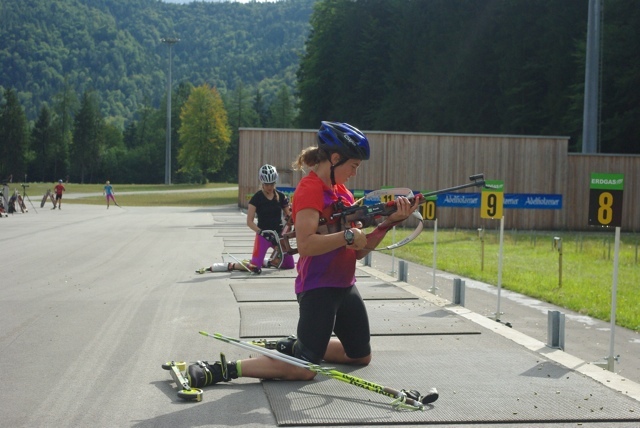 We have spent time at some of the winter World Cup venues and shared the ranges with European national teams and club teams. 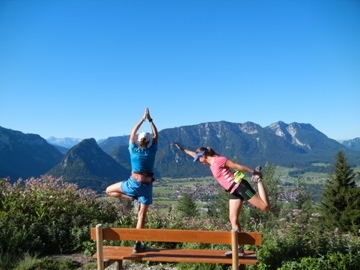 The first couple weeks were in Bavaria, training at Ruhpolding. 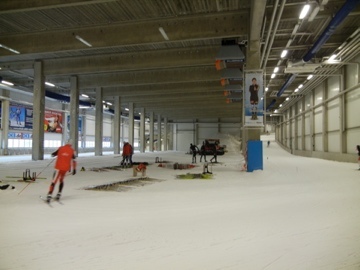 This week we are training in eastern Germany at Oberhof and using the indoor ski hall a lot. Unlike camps back home, we have almost all of our team staff together onsite, including coaches, wax techs, physios, etc, most of whom live in Europe. One of my favorite things about being over here in the summer is that we can get out and see a lot of the surrounding area. In the winter race season, we are lucky if we see more than the venue, the hotel and maybe the grocery store. 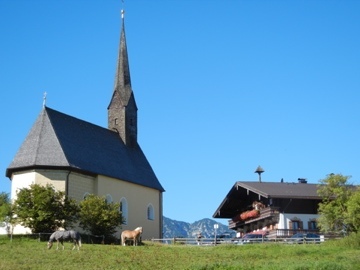 In Bavaria we stayed in the town of Inzell, at the foot of a mountain. Our cabins had a pool out front, which helped us survive temperatures in the mid 90s. 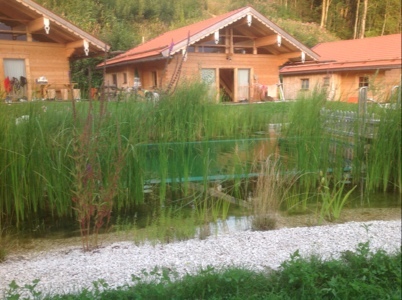 The pool was chemical-free and had recirculating water- the plant life along the edges filtered the water and kept it clean. The valley was very green and idyllic, with lots of small farms. In some ways it reminded me of Craftsbury. 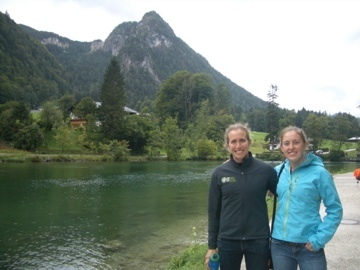 The team experienced all sorts of interesting Bavarian foods during our two weeks. 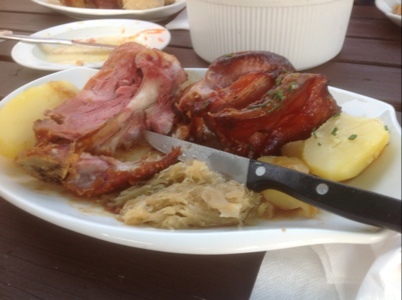 Pictured above is Schweinshax’n, or roasted ham hock. My favorite meal was smoked trout, served whole. The most interesting was a lean unidentified chunk of meat that tasted a lot like corned beef. After I ate it, I was told it was cow tongue. … and not just for us. 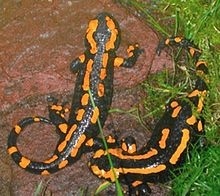 I found a whole hillside crawling with 6 inch long Fire Salamanders one rainy morning. This sighting was very special for me. When I was in kindergarten, I used to have a pet salamander a lot like these (it was an Eastern Spotted Salamander), and back home it is really usual to spot them in the wild. (photo credit: Wikipedia). 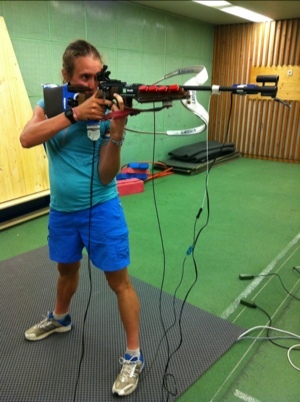 We spent one afternoon at the University of Salzburg’s indoor shooting hall. They hooked our rifles up to various force places and lasers that recorded things like trigger pressure and the path our barrels trace over the target. 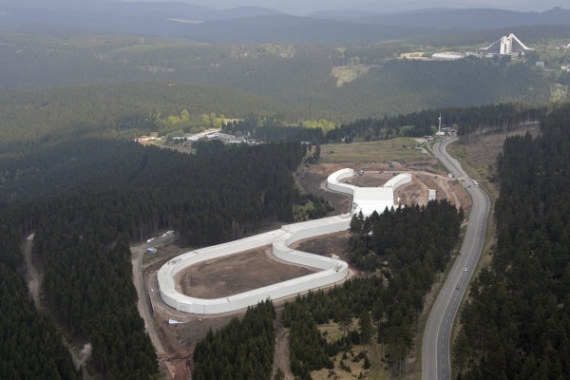 This past weekend we relocated to Oberhof, where we spend our mornings training on snow in the ski tunnel and our afternoons training outside. 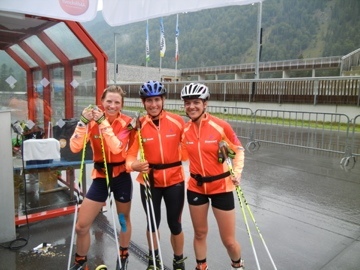 We are working closely with our team techs to test new skis for the coming season. The view from inside. The smaller branches depart from the corners of the hall and the loop is surprisingly hilly.